Acromegaly is a disorder that affects the hormone production of your pituitary glands. This disorder typically affects middle-aged adults and results in bones in the hands, feet, and face increasing in size. Here is a look at the symptoms, causes, diagnosis, and treatments for this rare condition. Your pituitary gland is a small gland that is located at the base of your brain and is responsible for producing many different hormones. The cause of acromegaly is the overproduction of growth hormones by the pituitary gland over a long period of time. The cause for this malfunction is usually a tumor of some kind, and it may or may not be cancerous. GH and IGF-I measurement: This involves fasting overnight and then taking a blood sample to measure the levels of GH and IGF-I hormones in your blood stream. If you have elevated levels of these hormones, this could indicate acromegaly. Growth hormone suppression test: This is the only test that definitively diagnoses acromegaly. This test involves measuring your growth hormone blood levels before and after drinking a glucose preparation. 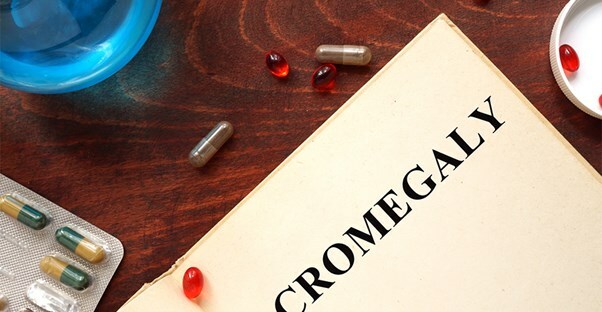 Since glucose will typically depress the levels of growth hormones in your blood, if the GH levels remain high, this means you have acromegaly. Imaging: After you are diagnosed with acromegaly, your doctor may want to perform some imaging tests to locate the tumor that is causing your symptoms. This usually includes a magnetic resonance imaging (MRI). Treatment for acromegaly will vary depending on the type, size, and location of the tumor that is causing your symptoms. The goal of treatment is to lower the production of your growth hormones and reduce any negative effects the tumor may be having on your pituitary gland and other surrounding tissues. Common treatment options include surgery to remove the tumor, medications to block the production of growth hormones, and radiation to kill any remaining tumor cells after surgery. More than one type of treatment may be required to completely cure the condition.